1. I switched the iPad into do not disturb mode. 3. I’ve insisted that all communications relating to the productions that I am organizing go through slack. Slack is the place where I can keep professional communications, files, notices, production documents, images, and a separate channel for nonsensical communications. Now that Staller’s Cabaret and Theater Three have been outfitted with deliciously functional wireless networking equipment, rehearsal is a pleasure to document; I don’t even have to leave the immediate area to be productive, online. Since my last iPad reflection, I’ve been exploring more options for diagramming apps. I’ve found a cloud-based one that I like a lot called LucidChart. I’ve previously used draw.io, which is similar but the mobile browser experience is terrible. LucidChart has a native iOS app in addition to their browser version. Since it’s cloud-based you can easily go back and forth between devices and collaborate on diagrams. Also it can be integrated with Google Drive. The free version limits you to 60 items per diagram but this hasn’t been a problem for me yet. I’ve been experimenting with an app called Lemur. I have used this app previously as a MIDI controller for Ableton Live, but now I’m examining new possibilities that will allow me to use my iPad to construct and control samples of urban soundscapes so I can emphasize different noises that are present in a variety of cities around the world. Even though the Lemur app is very user friendly and gives me the ability to construct button and slider configurations using my iPad, I find that the button and slider configuration software on my laptop is easier to control. Maybe it’s a matter of practice. I like to be able to swipe between windows and desktops to compare information quickly, which is not an option with the iPad. I’m trying a new note taking app called Notability – it is very similar to Good Notes, which I use on a daily basis, but Notability offers voice recordings connected to notes. I think this feature could be useful, but I need to test it out. The was a day this week we here I forgot to pack my laptop in my bag but remembered my iPad. With a little getting used to I was able to do all my tasks that day using only the iPad. Some of these tasks included taking notes for class, studying via ebook, sending and reading emails, and preparing a presentation. Earlier this semester I had mentioned a few qualms I had with the native keyboard and my “need” for an external keyboard. After 4 weeks of occupying the iPad I realize I may have been a bit to hasty to make a judgement. While there are some functions that would definitely improve the native iPad keyboard (arrow keys when working on cell based programs/apps), the native keyboard is functional enough for everyday use. Do not get me wrong. My iPad experience would definitely be better with an external keyboard. Cole shared a link to some third party keyboards for iOS 8. I’ll be checking out a few of them so expect a review in my next post. Now that I am about a month into using the iPad, I feel that I need to come forward and admit a few things. I love the iPad in general. The UI is great and quick, and I can’t get over the multi-touch swipe function. However, I feel that I am beginning to plateau in the iPad’s functionality. Granted, this plateau is probably representative of the tiredness that I am feeling in the rest of my work. So maybe I should also call it a lacking of patience. In the first couple weeks, I was still getting used to the iPad; now, I feel fairly comfortable in my abilities. I am beginning to notice a speed curve. I feel that I can type fairly fast considering I am using an on-screen keyboard; however, some things just refuse to work with iOS properly. This website, for instance, is nearly impossible to deal with. I usually give up and go to a computer for my blog posts. I have to swap back and forth between the “text” and “visual” options just to get these simple paragraphs entered. I know that Stony Brook is working on getting support from the WordPress and/or Edublogs app though. I also was surprised a few days ago to realize that I had to download a separate app in order to play .wav files…that’s a fairly generic file format that I hope that I am just completely iOS incompetent and that Apple did not not support! More than just being a music major, I appreciate high quality audio, and iTunes isn’t really gonna get it for me. For now, I am also experimenting around with different productivity apps, and in particular, apps for note-taking and writing. I have to read a lot for my field, and I love getting to highlight and whatnot in a book. So as a positive note, let’s see what the iPad can do since I keep finding things it cant! Using my laptop has become very rare over the past few weeks now that I have the iPad. I have no brought my laptop to class once semester, which I never expected to happen. This week I downloaded a few new apps like Google slides and Slack. I’ve only used Google slides so far when I met with my group Too Disruptive. It was nice to all be able to edit our slides using our iPads and see the edits being made in real-time. We were able to quickly divide up the work into teams and choose the order of topics we want to present on Thursday. 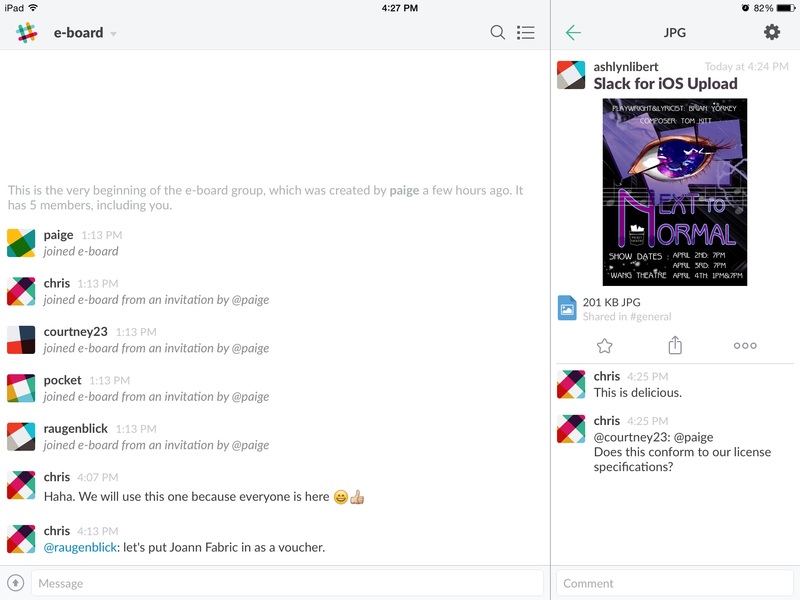 I’ve yet to use Slack but Chris S. has been raving about it being a great app for communication among groups so I figured I’d give it a try. I’ve also been using Google Drive a lot more to store my Photoshop artwork since the files are too big to save to my netID drive. I love being able to work on stuff in class in Staller but then being able to open it up later on in the day when I’m at a different Sinc site or on my laptop from my dorm room. I’m still incredibly impressed with the battery life of this thing. I continue to charge it every night before I go to sleep but I’m confident that the battery could last at last 2 days of classes before needing to be charged. I love not having to carry a charger around, although it wouldn’t even add that much extra weight to my bag even if I did. I’ve gotten more and more used to not having a physical keyboard although I’m still interested in purchasing one just to make writing long documents slightly less tedious. I’ve been wondering if there’s a way to print directly from the iPads to a sinc site but I don’t think there’s a way to get the print from anywhere app on the iPad but I’ll keep looking.